I am a fun of good puns, the kind that make you laugh out loud or at least chuckle! So I am always on the look out for ways to pun up the fun! My father in law's birthday is coming up and he is a golfer so what better way to mark the occasion then with a golfing themed birthday card! 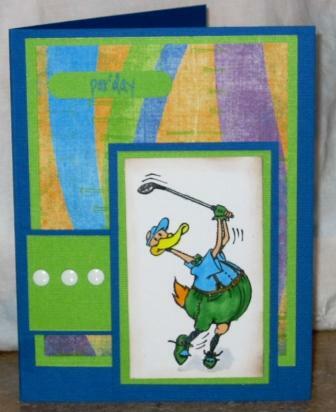 Of course I wanted it to be really golf themed and it is hard to find stamps that are themed as puns. So I used my Pazzles to write out the "Par'day" tag and then on the inside, wished him a "Swinging good time"